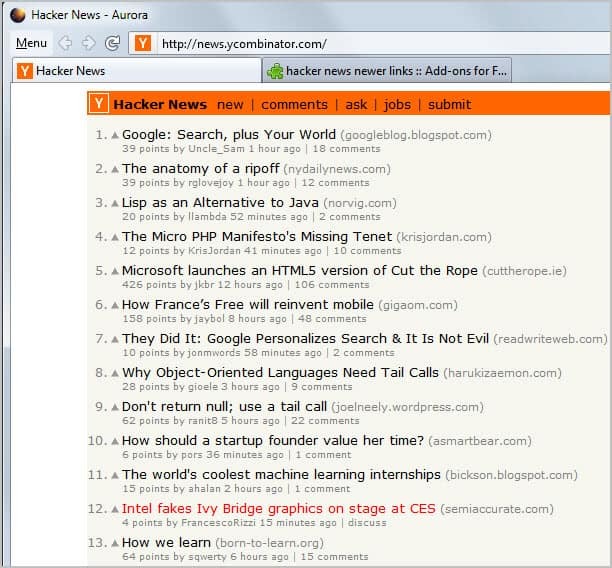 Hacker News is a popular news aggregation site with a focus on Internet, computers and technology in general, and news of general interest. It is a lot like Reddit in this regard, as it allows users to vote for and comment on news that are posted on the site. Everyone can submit news and votes decides whether it will be listed on the site's frontpage or only a page in the back that barely anyone notices. One of the issues that you may have with the site is that you cannot distinguish new links from old ones. Everything looks the same and the dynamic ranking system makes it incredible difficulty to near impossible to spot new news among the old listings. Most users probably go through all news from top to bottom whenever they visit the site to spot the new items in the listing. While that may be a working strategy, it is not optimal as you spend more time than you should finding those new links among the old ones. Update: Hacker News Newer Links is not compatible with Firefox 57 or newer. While there is no compatible extension that replicates the functionality of the add-on completely, you may find the following extensions useful that are compatible with Firefox 57 or newer. Hacker News Enhancement Suite adds a wide range of features to the site including the highlighting of clicked links and of new comments on the site since the last visit. Hacker News Comment Highlighter highlights new comments on the site. Enter Hacker News Newer Links. The Firefox extension's sole purpose is to highlight new links on the Hacker News front page and first page. Note that those are the two only places on the site where new entries are highlighted. You won't notice the extension on your first visit to Hacker News after installing. It stores all links on the frontpage and first page, and compares them to the listings on consecutive visits. All new listings are highlighted in red, while everything else is displayed in the normal colors. With the extension installed, you are able to spot new listings on Hacker News immediately after the page is displayed in the web browser. Hacker News regulars can download the Firefox add-on from the official Mozilla Firefox add-ons repository. Find out how to highlight new content on the news site Hacker News (https://news.ycombinator.com/) using extensions for the Firefox web browser. I have looked at the news which this website provided the last few hours and I have already found an read some good stories. Thanks for this link Martin.